I wasn't planning to make this week "illustration week" on my blog, but I guess it's turned out that way. Illustration is still, I believe, an important means of rendering a room, although it's a trickier endeavor than perfume ads. Oftentimes, I find myself wishing that I could see an actual photograph of a room in order to really absorb the details. The drawings shown here, executed by artist Sheridan Kettering, appeared in the September 1948 issue of House & Garden. 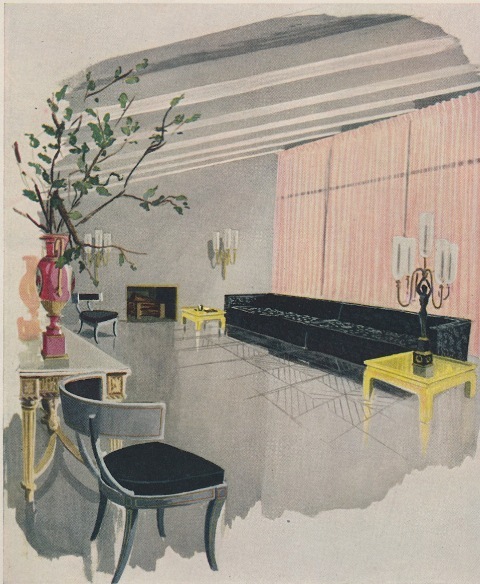 According to the accompanying article, all of these drawings represent interiors done by Billy Baldwin while he was still with Ruby Ross Wood, Inc. Unfortunately, there is no other information about location, homeowner, etc. I tried to find actual photographs of these rooms, but came up with nothing. So, I've typed out the captions that appeared alongside each drawing in hopes that it might help a little. I suppose we'll have to use our imaginations to flesh out these rooms. 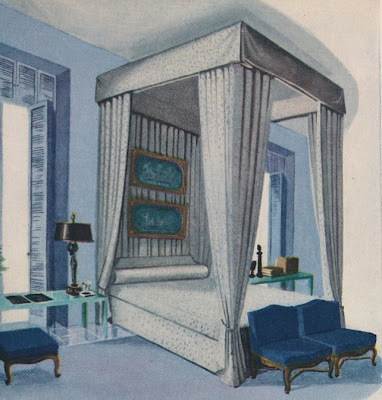 If any of you know any other details about these Baldwin designed rooms, do tell. Bright walls are excellent as shock value in a transition room, here in Citron Yellow, tempered by a Copper-carpeted stair. 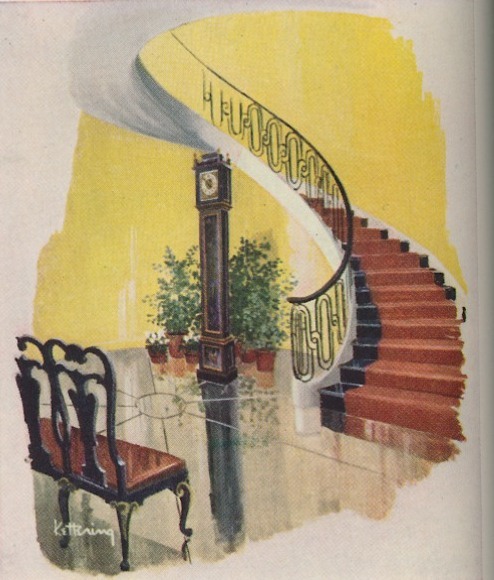 Parchment-stone floor, iron rail, black-and-gold Queen Anne clock, green plants, set the foyer atmosphere, which should be formal and architectural, but alive. Sprout Green velveteen curtains bound this dining room with positive color blocks. 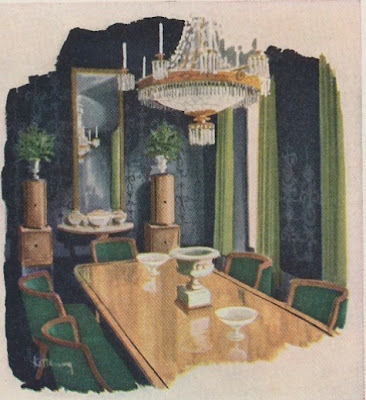 Black flock paper, black tile floor create an illusion of distant walls, draw the eye to Forest Green upholstered Biedermeier chairs and mahogany table, in which an Empire chandelier is reflected. Highlighting a room's center makes for good conversation on a black-tie evening. Varied in a man's bedroom, cold and warm blues start at the French Blue floor, climb the scale through sturdy Bright Navy to the flash of Kingfisher Blue. See how, by keeping to one color, you gain two more which in a wider palette would be overlooked: the strong brown of French Provincial walnut, the dry-textured white of the cotton bedspread. Against quite Stone Gray, spacious in a party room, Sweet Pink cotton voile curtains and Citron Yellow leather coffee tables look festive. 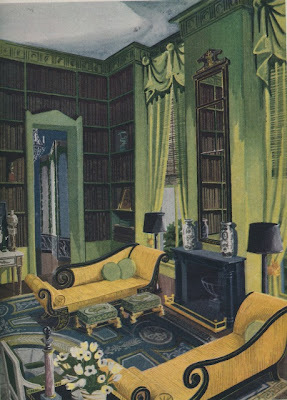 The modern feeling of this room depends not on furniture (Empire and Chinese-inspired) but on monotone treatment with enough space around each color note to let it register. Quartz Pink floor and walls make the shell of this lady's bedroom. Flame cotton taffeta bed cover is for drama, the glazed chintz butterfly print curtains are for prettiness. The Portuguese chair, painted gray and upholstered in horsehair, proves that antiques can sometimes be improved on. 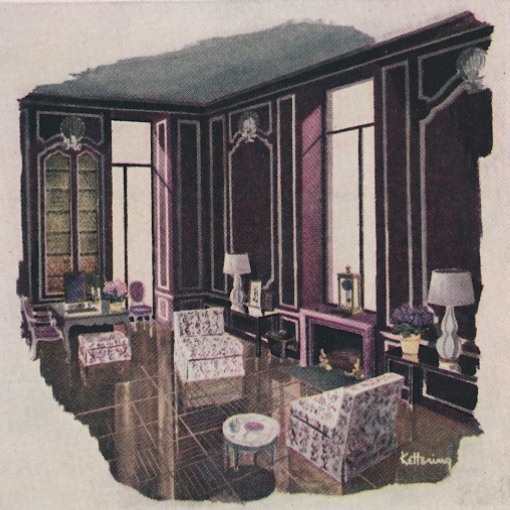 White moldings, picked out as elegant tracery on Charcoal Purple walls, underscore paneling and support the theory that woodwork, as the "bones" of a house, should be uniform throughout. To keep the mood of the living room restful, armchairs echo the scheme, are covered in white and Purple Heather. Amazing use of color--not only employing it, but also controlling it. Nonetheless, I wonder how much of the charm is due to the actual room designs, and how much to these great period illustrations. As you know, decorating magazines of the past were full of "editorial" projects by well-known designers. They were common through the 80s, filling in needed gaps in content as well as providing product placement. Especially for color, a rendering was less expensive than a photograph. Despite the text in the article, I cannot help but wonder if these were not idealized projects and photographs of them will not be found. Great to see in any case, however. made, and not a single word of Product Placement! Thanks so much for sharing these. The more I see of him, the more timeless he becomes. Dahhling I couldn't agree more with you, most often than not, looking at drawings of beautiful room always leaves one wishing for more details..but something is better than nothing at all. Beautiful rooms! To Anonymous at 4:55, it is possible to divert the flue and have a window above the fireplace. (I once lived in a house -- actually I lived in the converted rabbit shed -- in France with a big plate glass window in place of a mirror over the mantle). 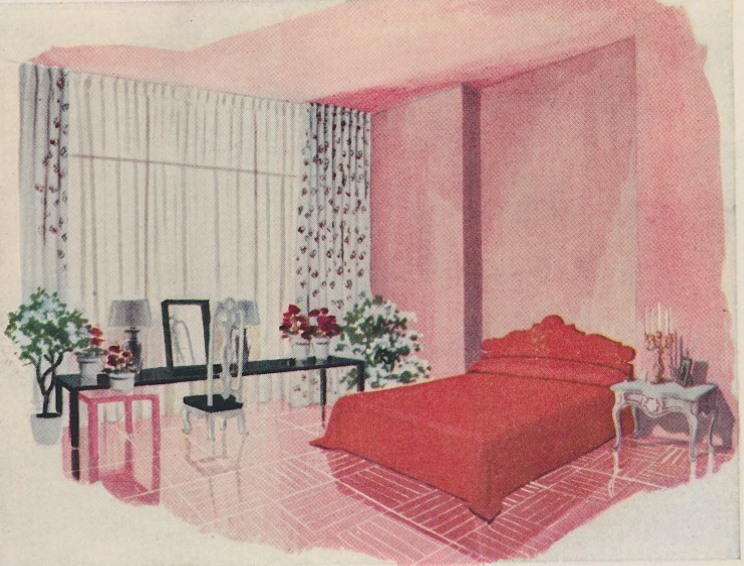 But I still think the illustrations were to make a point for the magazine rather than to represent an actual room. I enjoyed seeing them, though!